Just who put the ‘Amen’ in ‘Amen Corner’? Sadly, Aubie doesn’t get to try on new Gator-skin boots each year anymore, so the only way to have a TRUE three-game “Amen Corner” nowadays is to get at ’em in the SEC championship, right Coach? But who originally called those torturous holes that swallowed souls in Augusta “Amen Corner”? Well, it sprang from the mind of Herbert Warren Wind in his April 21, 1958 Sports Illustrated article about the Masters that year. Wind was also the author of the popular (but now out of print) The Story of American Golf. But why did he decide to call those three holes “Amen Corner”? So for that last act of this years “Amen Corner,” let’s do like Mrs. Swing tells us in those last few notes: Put Ol’ Saban on the run. 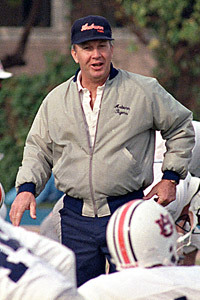 Related: The Patchwork Pat Dye, Part I.
It’s articles like this one that make this web site one of the best places for an Auburn fan to check out on the internet. I wouldn’t have ever even thought to ask about it, but I love it. Here’s to being able to shout “Warn Damn Eagle” in that Amen Corner. I somehow continually get confused and think it was a reference to turn three at Talladega. 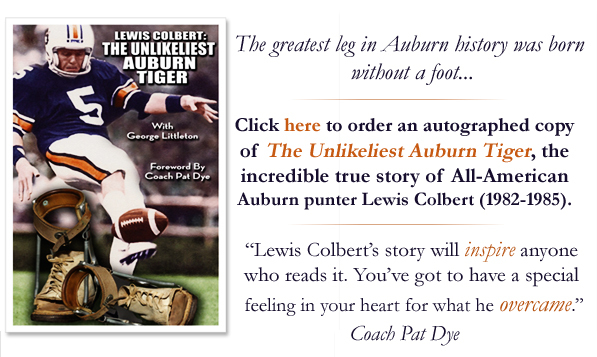 Also, i wonder if the owners of the Amen Corner Christian bookstore are Auburn folks . . . I wonder why Bama bloggers are referring to their own ‘Amen Corner’? I’ve lived here almost my whole life and most of that in Bham and I’ve never heard anyone refer to the end of the season as ‘Amen Corner’, except Pat Dye.